The first reported airplane flight in Vermont took place at the Caledonia county fair in St. Johnsbury on September 15, 1910. The fair was scheduled to take place on September 13, 14, and 15. The following article appeared in the Barre Daily Times on September 16, 1910. Successful performance by John Willard at the St. Johnsbury Fair yesterday afternoon. St. Johnsbury, Sept. 16 – Over 10,000 people attended the closing day of the Caledonia county fair , the attractions being a decorated automobile parade, three fast races, and two magnificent assentions by Charles F. Willard, the noted aviator, in his biplane. In the automobile parade, there were over 100 machines, with $250 in prizes. In class I, John C. Clark won first prize, the Commercial Club second, O.H. Rixford of East Highgate third. In class two, Dr. T. R. Stiles won first, Asselin brothers second, and Dan A. Perry of Barre third. Lyndonville took the prize for the most cars from one town and for decorated cars. The first ascent in Vermont of an aeroplane was a success from start to finish and created great enthusiasm. In his 18 months of aviation, Mr. Willard told the correspondent it was the roughest course he had ever tried. The groundis not only rough, but the nearness of the foothills causes a confusionof aircurrents and prevents any long distanceflight. But in spite of natural difficulties, he kept the machine under perfect control all the time. In his first flight of about six minutes, he covered about five miles, following the valley of the Passumpsie river, and rose to a height of 506 feet. His second trip was shorter, but more spectacular , as he circled the fair grounds almost within hailing distance, and his sensational landing created whirl of applause. Mr. Willard left for Holyoke last night, where he will fly on Saturday. 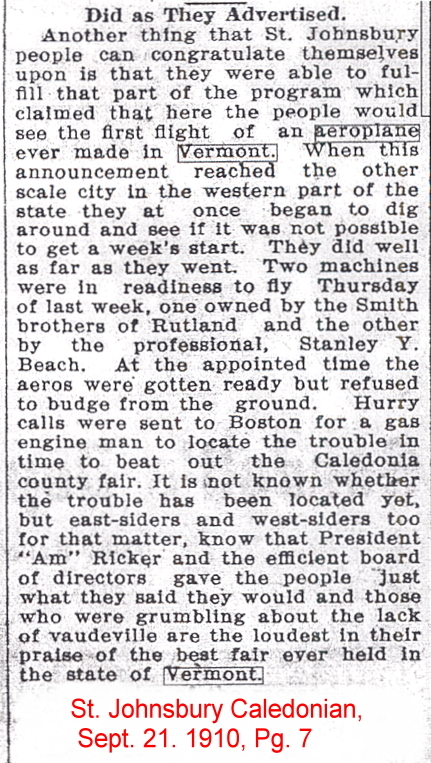 The flight in Holyoke mentioned in the article took place September 17, 1910. Prior to his exhibition at the Caledonia county fair, Mr. Willard had attended the Squantum Air Meet held in Quincy, Massachusetts, a little over one week earlier. 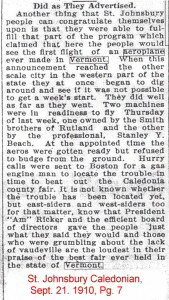 The following articles which appeared in the St. Johnsbury Caledonian on September 21, 1910, (Page 7) provide greater detail of his historic Vermont flight.